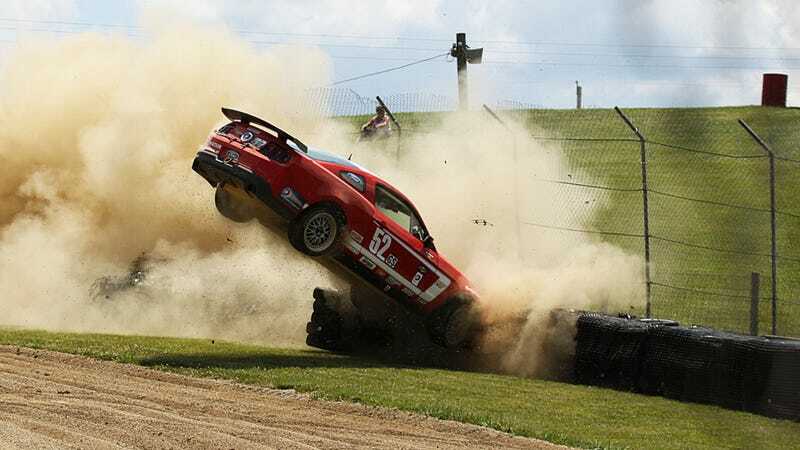 Our friend Trevor Andrusko was in perfect position to see the #52 Boss Mustang of Rehagen Racing fly off a corner at Mid Ohio. This incredible video and photo from the accident shows precisely how important those long rows of spent Michelins truly are. Most safety technology revolves around the basic physics of force = mass x acceleration. Reduce the acceleration (make the accident longer) and reduce the force. It's how crumple zones work, and it's one reason why tire barriers are everywhere on tracks. Just watch the beautiful Mustang head straight towards the tires with almost no reduction in speed (brakes fail?). As dramatic as the crash looks, the car is actually shedding momentum as it spins up in the air and around. No word on the driver's condition, but the damage doesn't appear that great when the car finally comes to a rest. UPDATE: The driver is apparently in good condition and the accident did occur because of a brake failure, according to a source.